After our discussion, as my role is to chose, design and research about the materials and furniture, I went ahead with the chosen display identity which we discussed as a group. How much wood we’ll need? What kind of wood we’ll need to buy? How big or tall it will need to be? How will it work with in the space? How many suspending wooden structures will be in place in each studio? How much tape will we need? Clips for hanging up the work? Push pins or any nails to help hand it in place? As we’ve all decided that our wayfinding will probably be used with tape, and used as our guide to the different studios etc. I started to do a quick internet research of the tape that we’ll be able to obtain at a reasonable price. In my opinion, as the tape will mostly be used in the halfway outside the studios, so the amount of tape we may need to this, will need to be between 1 and 2 meters long. Just in case, we want to consider it for both sides of the corridor. Above, in the image, it shows the tape that would fit close to our decided colour scheme and would work out the cheapest so far. I did say in my previous post, when discussing my ideas and plans for the material that plywood work out to be the cheapest and the probably the best wood to use in this situation– I took a trip to several stores: Homebase, B&Q and another DIY store, and I found that particular material to be too flimsy and thin. It wouldn’t be a very good idea to have that standing up on it’s own, especially as people will have to walk around it, it could probably fall down and cause too many accidents. SO, the next choice of wood would probably have to be chip board OR MDF, as my next considerations. Looking at their largest pieces of wood, on Homebase first, I would like to work out the next few steps. Cost and quantity. I checked out chipboard, as this was one that I wasn’t so certain about at first. When I did resistant materials as a subject at both A level and GCSE, I had no experience with using this material. So, I wasn’t aware of what it would be like in it’s thickness, but as we also have this material in our loft, I was thinking that it may of been study enough, but as this was the only one they offered, the thickness doesn’t look as if it would be able to stand up sturdly, unless we attack some sort of feet to the bottom to support it up and make it balance. However, MDF, after looking at the offers they had on one particular store, they’re pretty cheap. Also, we could buy a pack of 4. That could save a lot of money, if you were to buy 5 lots of the pack of 4, for example. That would work out to £210. I’m still doing some more research in to all of the options we have and seeing what would be the most beneficial. Being able to refresh my mind with this subject again was very rewarding and constructive. Going through the basics, and defining what critical design thinking was about, I’ve come to learn that it involves: Knowledge, analyse, comprehension, evaluation, breaking down and reflection. Being able to reflect and go through a series of process helps to gain an understanding of the work or objective that may occur or at mind. From this, I may have to consider engaging myself more with the work set and the projects I’m involved in and setting more tasks or a time table to let myself be able to be more organised and co-operative with the tasks at hand. A tricky, but fun task. We had to connect them all in five strokes/lines. 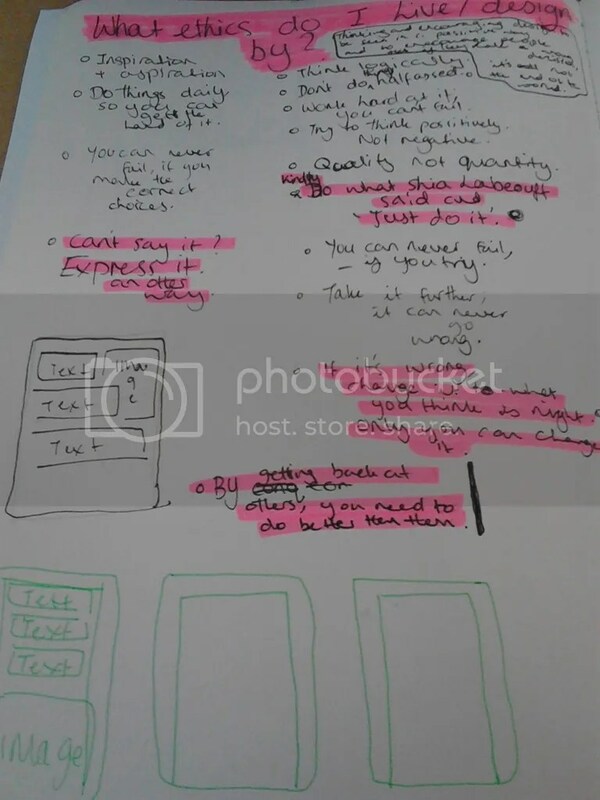 The later tasks were very straight forward, but before I did find them just as tricky, due to over thinking about the idea and going for a very simple design for the book. Afterwards, I decided to just be more creative with the outcome of the book by making it a book that folds out in to many books on the inside. Welcome back to another update on the Critical thinking rotation. This time I’ll be quickly whizzing through the last half of the work I’ve accomplished so far for that week; I would like to also let you all keep in mind, that this is a on-going project, so it is not totally complete yet. 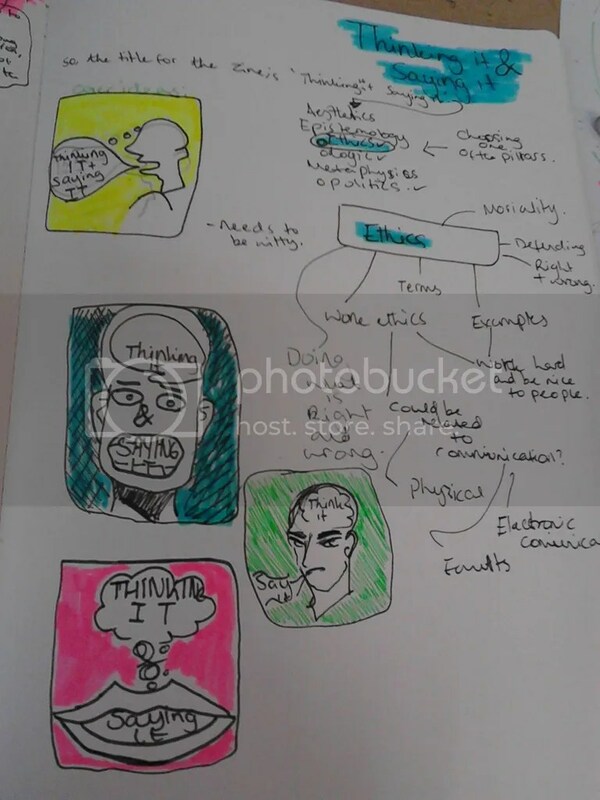 I would also like to put forward what I had discussed yesterday; I started to talk about the subject, and my thoughts on the term ‘Critical thinking’, I mentioned that for the fanzine project, I would narrow the theme down to Ethics and the saying ‘It’s not the end of the world’. it’s quite a true ethic which I look up to and follow myself. I had a quote from a manga series that particularly influenced my style of writing and drawing now, and it goes like this ‘Dream exist to be realized. If you don’t do it, who’s going to?’. It’s true. Not only when you find yourself stuck or hoping to do something that seems impossible; only you can be the one to accomplish the thing you want to achieve. No one else. It’s you who has to pick up those pieces at the end of the day. Taking this idea forward, I got some ideas down. I wanted to do something humorous, or try to play on the word ‘change’. Change can mean plenty of things, depending on the person using it. Change can be money, change can mean a process or form that is different from it once was. I had three things I wanted to do for this, but I had to consider that it needed to make sense to almost everyone who was going to possibly look at it. 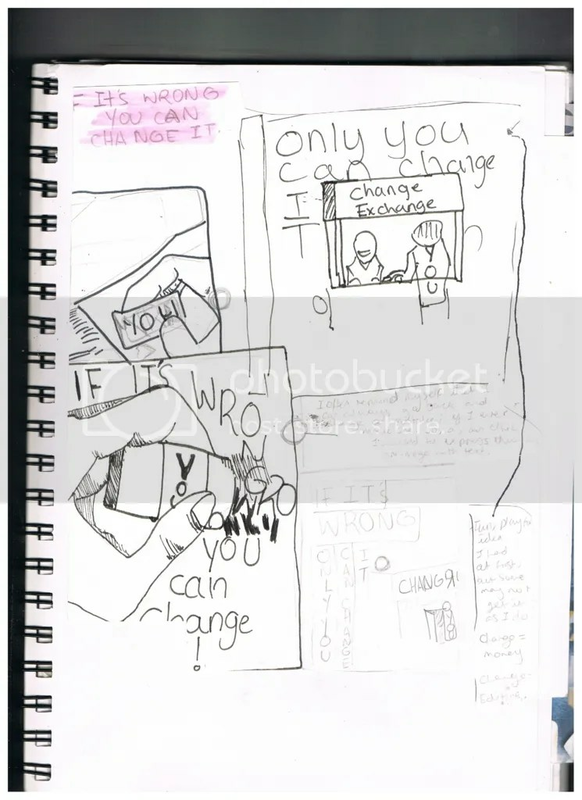 So, the idea of having someone in the drawing go to a change exchange store was out of the picture. Rubbers/Erasers are often use to erase the mistakes we make and I thought this could possibly be a good method of communicating to the person looking at it. I had some advise from Sara about considering the style of text and making adjustments to the hand, to make it look as if it’s hand drawn to fit in with the idea. This was pretty helpful advise because it opened my thoughts on how i could think about publishing this; I need to keep in mind of how I’m going to do this. I was planning on producing the text in the screen printing room, or drawing it down and scanning it in for Photoshop. On the other hand, I could link this project back to what I’ve learnt in mark making and use mediums such as, charcoal or pencils. This saying wasn’t the only one I had; I also had another saying I wanted to work with, but coming up with ideas was tough. I did, however, make a very draft ideas, but really, the first idea stood out in my opinion. Starting of the week, I was placed in to group B and this was our chance to do some Critical thinking. In my opinion, when approaching this subject, I always make the assumption that critical thinking allows us to ask our selves questions on the things we do or what has been presented. Asking ourselves questions, such as ‘Why’, ‘How’, ‘What’ and ‘When’. It goes much further than this; we have to always consider including the special three W’s and the H words, though, we need to take it to other places. You have to put in a lot of thought in to the production, progress and reflect. As an illustrator, I often find myself thinking about whether or not does my image strongly reflect what I want to get across or does the stories I write make any sense to other people? what can I do to grasp their attention? Being given the last task, as I was not in on the Monday of that week; the task was to create two pages for the Zine– The center page and the front page. I also had to select one pillar from the following subjects: Aesthetics, Epistemology, Ethics, Logic, Metaphysics and Politics. I was tempted to go with Politics, as my family discuss it quite a bit. I’m usually sat in my chair in the middle of it, just nodding my head and pretending that I understand every single word my sibling and father have to say. Then again, I gave the decision more thought and went with ethics. Ethics usually fit in to morality and what’s right and wrong. I found this amusing because this reminds me of the subject I chose to do for my poster project, so I had some ideas already for what I could do. What I’ve started to do in my sketchbook is, I’ve begun to break down what Ethics is and what examples could be given from it. 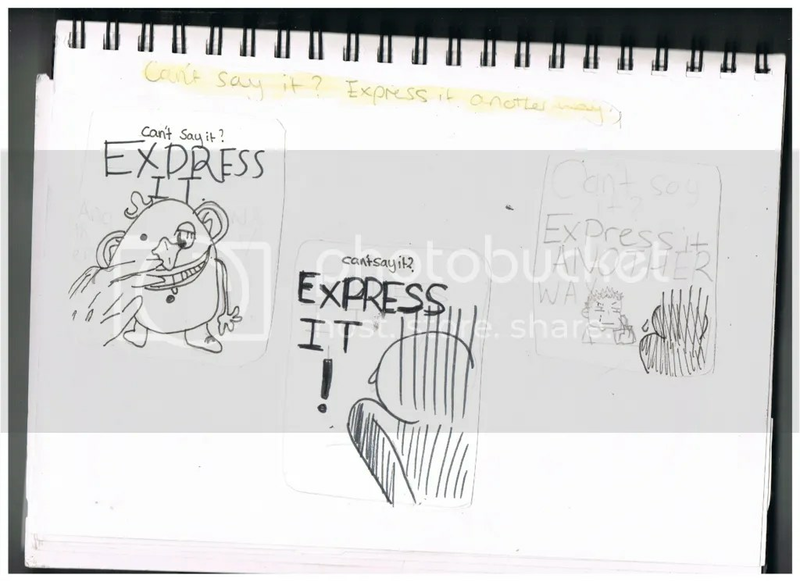 I also began to draw quick thumbnail ideas for the front cover, which will be based on the title ‘Thinking it and saying it’. By being playful with the words ‘thinking’ and ‘saying’; the first two images that came to mind were a head and a mouth. The head contains the brain/mind which is thinking so many things, while speech comes out of your mouth. Another page used for some ideas or quotes I’ve come up with. I wanted to try and narrow my ethic subject to be based on the saying ‘It’s not the end of the world’ because I always find that I tend to over worry about things not going the way it should, or that there’s no going back to undo or redo it, but that’s all wrong. There’s always time, there’s always a way of mending your mistakes. I will discuss this subject further in my next post. That will be posted up tomorrow.